Fiscal policy should be an essential part of the post-crisis macro-financial stability framework. As history shows, banking crises wreak havoc with public finances. Growing fiscal risks, in turn, weaken the financial system: directly, by undermining deposit guarantees and by weakening banks' balance sheets through losses on their public debt holdings; and indirectly, by limiting the authorities' ability to stabilise the economy through countercyclical fiscal policy. The tight two-way link between banks and public finances also creates the potential for an adverse feedback loop, in which financial and sovereign risks reinforce each other. Moving away from the present favourable treatment of domestic public debt in capital regulation to one that reflects more accurately sovereign risk is important to weaken this loop. But, by itself, it is not sufficient. Maintaining or rebuilding a sound fiscal position is key. Building sufficient buffers in a financial boom creates the room to repair balance sheets and stimulate demand if a crisis occurs. A stronger countercyclical stance may also help contain excessive growth in credit and asset prices. But the most important contribution to crisis prevention may come from removing tax provisions that unduly incentivise debt over equity, leading to too much leverage and greater financial fragility. Since 2008, policymakers have striven to contain the build-up of new financial vulnerabilities and to avoid repeating the mistakes that led to the Great Financial Crisis (GFC). They have tightened prudential regulation and supervision and made increasing use, especially in emerging market economies (EMEs), of macroprudential tools. But are these measures enough? Should not fiscal policy, too, be an essential part of the post-crisis macro-financial stability framework? Financial stability generally, and financial cycles in particular, hardly feature in the design of fiscal policy. Yet history shows that financial crises wreak havoc with public finances. The latest crisis is no exception. Since 2007, public debt in many advanced economies has reached unprecedented peacetime peaks, in some cases raising serious doubts about its sustainability. 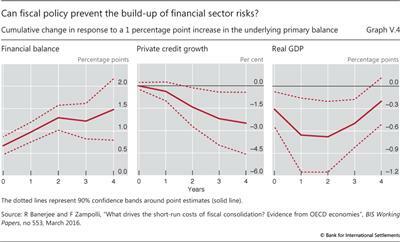 Growing fiscal risks, in turn, weaken the financial system: they undermine the credibility of deposit guarantees and other financial backstops; weaken the balance sheets of banks holding public debt; and reduce the scope for authorities to run countercyclical policies. The close two-way link between banks and public sector balance sheets also creates the potential for an adverse feedback loop. 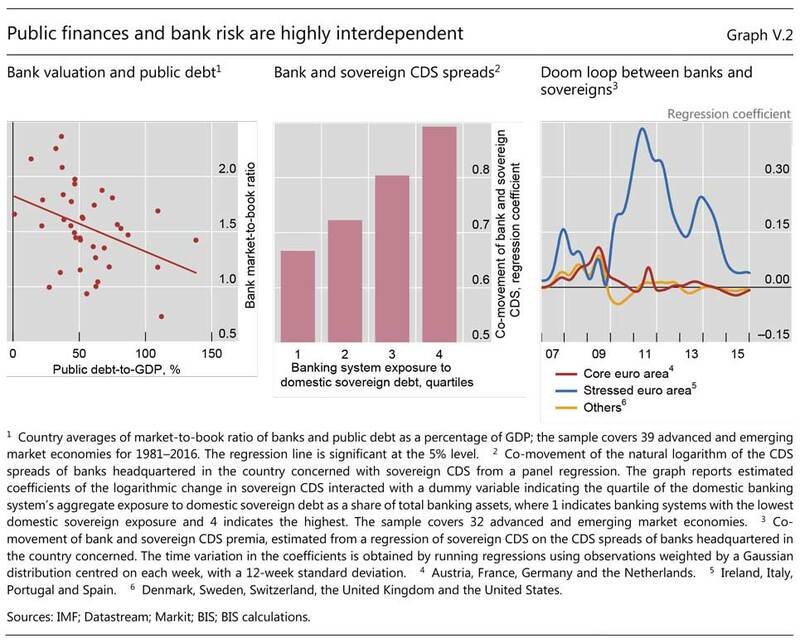 In this case, sovereign and financial risks reinforce each other, as demonstrated in the recent euro area debt crisis. To weaken this loop, it is essential to move away from the present favourable treatment of sovereign exposures in bank regulation to a framework that more accurately reflects sovereign risk. But this, by itself, is not enough. Banks would continue to be exposed indirectly, through the increased macroeconomic instability that rising sovereign risks can generate. Maintaining or rebuilding a sound fiscal position is therefore key and requires that fiscal policy be run in a prudent and countercyclical way. If sufficient buffers are built up in a financial boom, room is created to repair balance sheets and stimulate demand when a crisis occurs. At the same time, a stronger countercyclical stance may also help contain the rise in credit and asset prices. But the most important contribution to crisis prevention may come from adjusting the structural component of fiscal policy: in many countries, the current long-term composition of taxes and subsidies unduly incentivises debt over equity, leading to excessive leverage and greater financial fragility. After reviewing the historical record, this chapter discusses how the financial sector can be protected from the sovereign - focusing particularly on the treatment of banks' sovereign exposures in prudential regulation. It then suggests how a more active and targeted fiscal policy could be used to safeguard the sovereign from private sector financial excess. This observation does not make public debt irrelevant. On the contrary, another important conclusion is that the level of public debt critically amplifies the costs of a financial crisis. The higher the public debt at the onset of the crisis, the deeper the recession and the slower the recovery. Financial crises typically lead to substantial increases in public debt in their immediate aftermath. If public debt is already high, this may push debt closer to its limit. If so, sovereign spreads may soar and stabilisation policies may become severely constrained, worsening private sector financing conditions and deepening the output shortfall. What follows considers, in turn, the damage a financial bust causes to public finances and the channels through which fiscal risks exacerbate financial risk. Graph V.1 shows the behaviour of general government debt around banking crises over the post-Bretton Woods period. Three facts stand out. First, the post-crisis increase in public debt has been substantial in advanced economies and larger than in EMEs. The median rise is about 15 percentage points of GDP within three years in advanced economies (Graph V.1, left-hand panel) and 8 percentage points in EMEs (Graph V.1, right-hand panel). Second, debt continues to rise after the initial surge, if only gradually, for several years. Third, public debt is relatively stable before the crisis, consistent with the view that public borrowing is usually not responsible for the pre-crisis build-up of vulnerabilities. Compared with the post-1970 crisis episodes, the GFC has led to larger and more persistent increases in public debt. After three years, the median debt rise in advanced economies was about the same as in previous episodes, but it was over 10 percentage points larger after eight years (Graph V.1, left-hand panel). The larger increase probably reflects the greater severity and, to some extent, the policy response to the latest crisis. 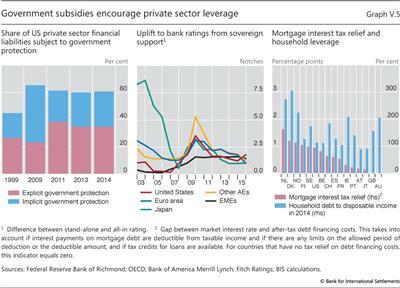 By contrast, only in a few EMEs did banks require public support during the GFC. 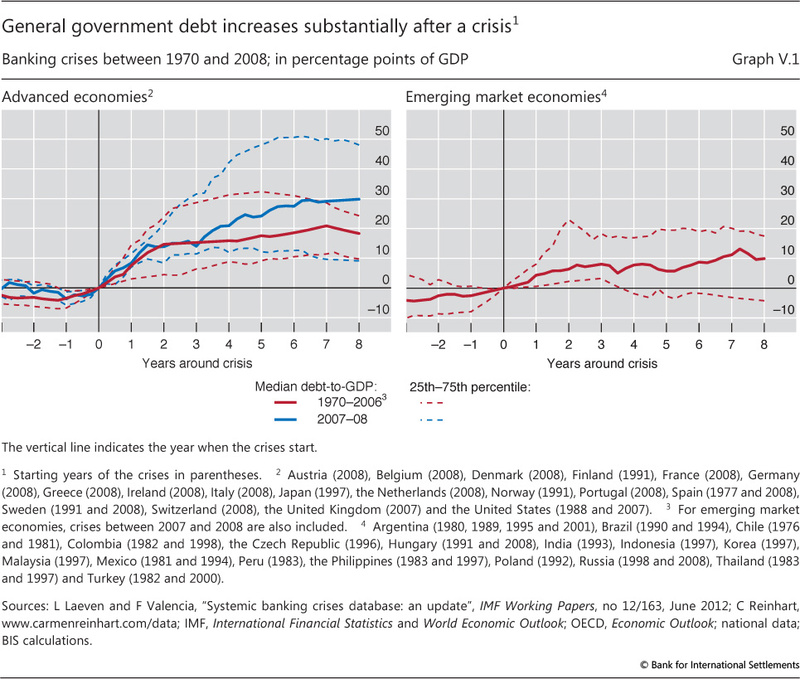 Several factors typically drive the steep post-crisis rise in public debt. First, the sovereign uses available fiscal resources to support the repair of banks' balance sheets (bailout costs). The government's role is critical, ranging from purchasing bad assets to recapitalising institutions, sometimes through temporary ownership. In some cases, the sovereign's support also extends to non-financial borrowers, including both corporations and households. Second, the collapse in output and employment and their slow recovery sap revenues and boost non-discretionary spending and transfers through automatic stabilisers. Initial output losses are substantial and surprisingly similar in advanced economies and EMEs, at least in the post-Bretton Woods period. Measured from peak to trough or from the peak to the point at which the growth rate returns to pre-crisis rates, such losses range from 6 to 15% on average across countries, against less than 4% in recessions not preceded by a financial crisis. In general, crises usher in weak recoveries: it takes several years for activity to return to its pre-crisis peak. Above all, there is evidence that these losses are not entirely recouped: the level of output does not return to its pre-crisis trend. The one-off permanent loss of output may also go hand in hand with a long-lasting decline in trend output growth. Until recently, the literature had generally failed to find permanent effects on growth. But recent research has found that productivity growth may slow down for many years.3 High public debt may be one reason. Lack of fiscal space may imply persistently higher credit spreads and higher distortionary taxation, which may exert a significant drag on productivity. Moreover, any reluctance to use fiscal resources to repair balance sheets can prolong the economy's weakness. The Japanese experience, in which repair was delayed following the early 1990s bust, is a cautionary tale. Third, the policy response may lead to a further deterioration in the fiscal position. If authorities have room for manoeuvre, they may increase discretionary spending or cut taxes to prop up aggregate demand. Several advanced economies did so in the wake of the GFC. In fact, in advanced economies the fiscal expansion, through either automatic stabilisers or discretionary measures, is frequently the single most important cause of the debt increase. By contrast, in EMEs the room for manoeuvre is smaller, most likely due to the tighter financing constraints they usually face after a crisis. Finally, exchange rates may play a similar role. This is the case whenever debt is denominated in a foreign currency and, as often happens, the crisis coincides with a sharp currency depreciation. Indeed, such concerns have been behind EMEs' attempts to reduce their reliance on foreign currency borrowing since the crises of the 1980s and 1990s. Even so, the sovereign may still remain indirectly exposed to currency mismatches if the private sector indulges in this practice. Moreover, even short of an outright default, an unsustainable fiscal position can have adverse consequences. One is higher inflation. Inflation volatility and uncertainty about the possible policy response can be very costly for financial and economic activity. Another is a sudden stop or abrupt capital flow reversal, which may interact with the financial damage caused by large currency depreciations. But, even before any of these scenarios materialises, a loss in the sovereign's perceived creditworthiness can have pervasive effects on banks. Several mechanisms may be at work. Second, a loss in creditworthiness can weaken banks indirectly, through its broader impact on the economy. For one, it can increase the cost of market finance. Sovereign yields typically set a floor under private market funding costs. Even large firms with access to foreign capital markets are not spared, unless they have large operations and sales abroad. In addition, economic weakness can depress credit demand and boost debt arrears and defaults among bank customers. Both factors also limit the ability of private non-financial issuers to substitute market debt for bank debt or equity funding. Finally, financial repression may also creep in. Faced with rising sovereign risk, authorities may introduce measures aimed at reducing rollover risks and borrowing costs (eg cross-border capital controls, financial transaction taxes).8 This erodes bank profitability and may further dent investor confidence. 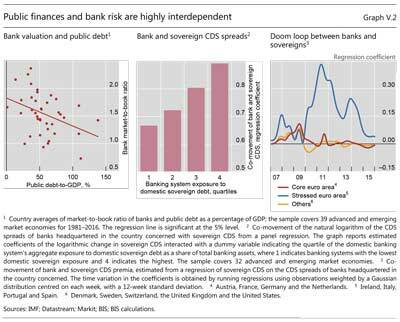 This analysis suggests that sovereign risk and financial system risk can be mutually reinforcing. Empirical studies too have found evidence of significant contagion and two-way feedback between them (also known as the "doom loop"). The GFC highlighted this risk. A number of findings stand out. Second, the size of sovereign and bank CDS spreads and their correlation tend to be higher in countries that are fiscally weaker. Similarly, weaker banks, as measured by market-to-book ratios, are associated with high public debt ratios (Graph V.2, left-hand panel). Furthermore, the two-way contagion is stronger for countries with a larger financial sector and a higher share of bank-intermediated finance. The GFC provides a vivid illustration of the feedback mechanisms at play. When the crisis began in 2008, bank solvency risk, as measured by CDS spreads, went up without increasing sovereign risk. After the first bailouts and explicit government guarantees, bank CDS spreads fell. But soon afterwards, this raised sovereign risk. And when the euro area crisis broke out in 2010, the co-movement increased strongly in stressed countries. 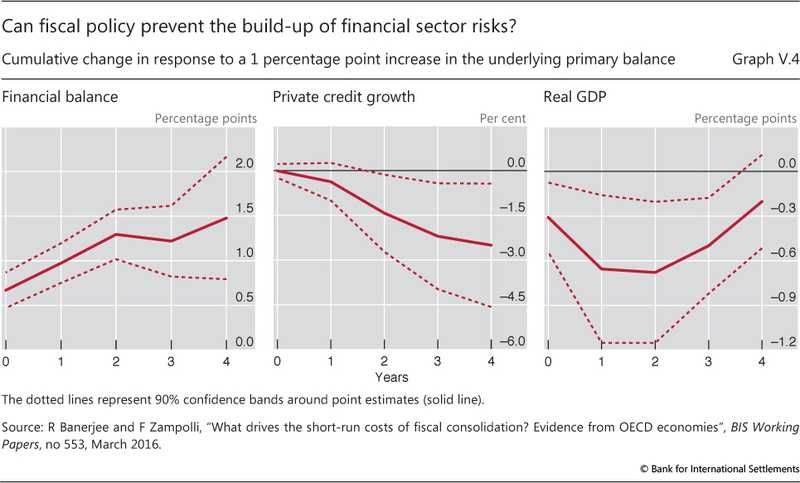 Confronted by high debt and a lack of fiscal space, financial market participants viewed risks as intertwined (Graph V.2, right-hand panel). In many countries, domestic government securities constitute a significant share of bank and non-bank assets, directly exposing them to sovereign risk. This is true of both banks and non-bank financial institutions, such as pension funds, insurance firms and collective investment vehicles. How can prudential regulation help protect them from sovereign risk? What follows focuses first and foremost on banks, given their critical role in systemic risk and macroeconomic stability. That said, a fuller treatment would also need to address other types of institution, not least given their growing importance in the financial system (Chapter VI). 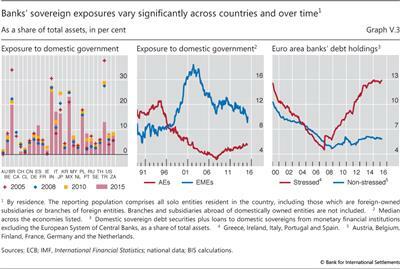 Banks' exposures to the domestic sovereign differ significantly across countries. 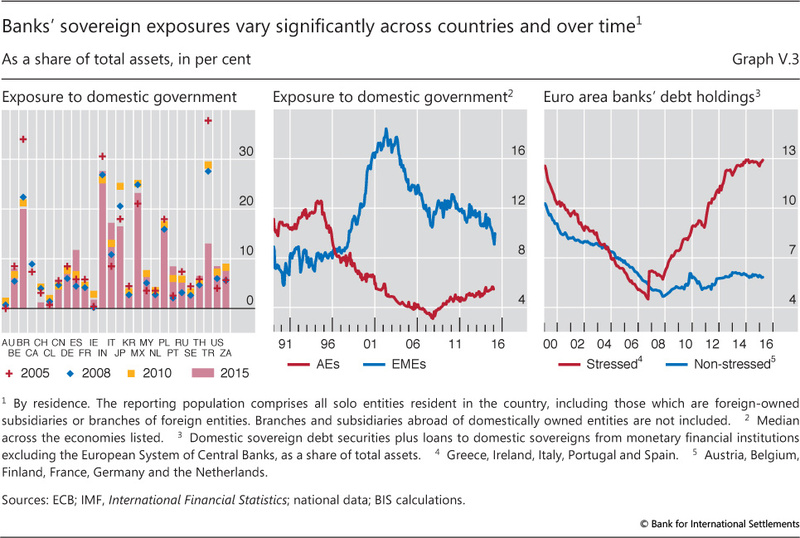 For example, as a share of bank assets, exposures are now relatively large in Brazil, India, Italy, Japan and Mexico, but small in Canada, Chile, Sweden and Switzerland (Graph V.3, left-hand panel). In general, they tend to be larger in EMEs than in advanced economies. Such cross-country differences tend to persist over time, reflecting in part structural factors. One such factor is financial depth. For example, in several EMEs government bonds are the only high-grade domestic security. A second is public debt. Banks in countries with high public debt, such as Brazil, India, Italy and Japan, naturally exhibit relatively higher sovereign exposures. A third is the central bank market operations framework, which defines eligible collateral. In some countries, for instance, only public sector securities are eligible. Finally, regulatory constraints differ across countries. Yet, over time and especially post-crisis, regulation has become increasingly harmonised, generally in the direction of favouring public debt over private debt. A good example is the new international standards for liquidity regulation, such as the Liquidity Coverage Ratio (LCR) (Chapter VI). Sovereign exposures also vary significantly over time within countries, reflecting both secular and cyclical forces (Graph V.3, centre panel). In EMEs, exposures (as a share of assets) have been on a declining trend, interrupted only temporarily by the GFC. This trend partly echoes the increasing financial sophistication and integration of EMEs, but also financial booms and hence strong private credit growth. In advanced economies too, sovereign exposures were on a downward trend before the GFC. Yet, as the financial cycle turned and public debt rose sharply, exposures began to rise again (Graph V.3, centre panel). Unsurprisingly, when credit demand declines and risk appetite is low, there may be no better alternatives to domestic public debt in terms of liquidity and safety. The post-crisis increase in exposures has not been uniform across countries. Particularly in the euro area, cross-country dispersion and the home bias have risen. Moreover, the home bias has risen relatively more in countries that were under fiscal stress (Graph V.3, right-hand panel). This seems paradoxical. To be sure, banks profit from the higher spread between their own sovereign and their funding costs. But this does not explain why investors in other countries do not take advantage of it. One possibility is that domestic banks' equity holders and managers are able to shift part of the additional risk onto bank creditors and the taxpayer (risk-shifting). In the case of a sovereign default, the lack of a backstop would affect all domestic banks, even those with little exposure to domestic debt. Another possibility is moral suasion. During market stress, authorities may induce banks to play a stabilising role as contrarian investors. Over time, however, this would risk tightening the link between banks and sovereigns unless policymakers took advantage of calmer market conditions to strengthen public finances. The Basel risk-weighted capital framework prescribes minimum capital requirements commensurate with the underlying credit risk, in line with the objective of ensuring risk sensitivity. This applies to sovereign debt too. There are, however, exceptions to the general rule.12 Under the Standardised Approach for credit risk and market risk, sovereign exposures are risk-weighted according to their external ratings, with positive risk weights prescribed for debt rated at under AA-. But national supervisors can, at their discretion, apply a lower or even zero weight to domestic sovereign debt, provided it is denominated and funded in domestic currency. Under the alternative method for credit risk, the Internal Ratings-Based (IRB) Approach, banks are permitted to use their own models to estimate default probabilities and loss-given-default. In this case, sovereign debt is exempt from the 3 basis point floor under the default probability prescribed for private issuers with broadly similar characteristics. In fact, the risk weights typically applied to domestic sovereign debt are often close to zero. Another key aspect of the present regulation is that sovereign debt is also exempt from the large exposure requirement that limits exposures to any single counterparty or group of connected counterparties to 25% of eligible capital. The standard argument for treating sovereign debt as if it were (almost) risk-free is that a sovereign can always meet the nominal repayment by issuing more of its own currency. This argument is vulnerable to three criticisms. First, debt monetisation may not be feasible due to institutional constraints, as in the euro area, or it may not always be the least costly option, as indicated by several past cases, especially in EMEs. Second, within a country, subnational entities (eg municipal or regional governments) or state-owned enterprises can and do default. This is normally reflected in different market prices for their debt. Finally, volatility in bond prices driven by changing perceptions of fiscal risks can hurt banks, even short of default (see above). This is true even when credit risk in a narrow sense is ruled out and investors worry only about higher inflation or currency devaluation. Eliminating the present favourable treatment of sovereign exposures would have several benefits.13 Ex ante, it would discourage the build-up of large bank exposures in domestic sovereign bonds, thus also limiting moral hazard on the part of banks and regulators. Ex post, it would make banks better capitalised and able to withstand financial distress. These factors should promote both better risk management and greater macroeconomic resilience, not least by attenuating the "doom loop". This could ultimately translate into lower long-term funding costs for both banks and the government.14 Moreover, by reducing distortions among asset classes, it could also increase the supply of credit to private non-financial corporates. These benefits need to be weighed against potential adverse effects on the functioning of the financial system. At least three are relevant. First, banks may have less room to act as buffers or contrarian investors at times of market stress. Critics argue that self-fulfilling liquidity crises may become more likely; and by limiting the room for countercyclical fiscal policy, country risk and hence the health of banks may deteriorate. However, reducing the scope for banks to play this role could improve the ex ante incentives towards sound fiscal policy, thus making market stress less likely in the first place. Policymakers will have to tread a fine line between avoiding bad outcomes ex post and providing the right incentives ex ante. Second, bond market liquidity may be lower even outside periods of market stress. Regulatory capital charges on government securities may increase bank intermediation costs in both the cash and repo markets for sovereign securities, as dealers reduce inventories. Yet, if banks become more resilient and market stress less likely, market liquidity should become more robust and central banks would have to provide emergency liquidity less frequently (Chapter VI). Third, monetary policy transmission may become less effective. Government bonds are a key source of collateral in repo markets, which facilitates arbitrage by enhancing bank liquidity and flexibility to fund positions. By inhibiting bond holdings, regulation may therefore lead to less arbitrage and greater interest rate volatility, hence weakening the impact of policy rate changes on long-term yields. Yet this is no sure conclusion. Non-bank institutions, too, may ensure sufficient arbitrage along the yield curve. And central banks could further help by adding such institutions to their list of eligible counterparties. Furthermore, by improving banks' resilience, regulation may reduce interest rate volatility on average, making the transmission mechanism more stable over the cycle. The strength of these potentially adverse effects depends, to a significant extent, on the financial system's structure and sophistication. In less developed financial systems, banks tend to have less room for diversification domestically. Their non-bank investor base may be relatively small. And diversifying away from home debt would expose banks to currency risk, which may be costly to hedge. Another important factor is the size of outstanding public debt. Countries with very high levels of public debt may find it difficult or impossible to impose strict limits on bank holdings. That said, financial systems operate with quite different levels of sovereign exposure, as noted above, suggesting that these are issues for the transition to a stricter regulation, but not necessarily an argument against regulation per se. Against this backdrop, any change to the current treatment of sovereign exposures would have to take into account a number of issues. The first is how to measure sovereign risk. Most sovereigns, especially among advanced economies, have not defaulted in the last few decades. While the recent historical record does not imply zero default probability or zero loss-given-default, it provides little information for estimating these two parameters under the IRB Approach. Under the Standardised Approach, instead, risk weights are based on ratings provided by external agencies (or, in jurisdictions where this is not possible, on alternative metrics). Credit ratings summarise a large amount of information and are supposed to be forward-looking. They are also readily available and known to provide reliable ordinal rankings of risk. Yet they also tend to change infrequently and abruptly, as rating agencies seek to avoid ratings volatility. Moreover, authorities in various countries have outlawed, or are now actively discouraging, their use for regulatory purposes. Alternative measures could be based on market or non-market indicators. The former, such as CDS spreads, are readily available and easy to translate into familiar risk measures such as default probabilities. But their pricing is also affected by liquidity risk premia and shifts in investors' risk appetite (Chapter II), making them highly volatile. Furthermore, the necessary data may not be available for all countries. This leaves more standard non-market metrics such as debt-to-GDP ratios and other indicators of fiscal sustainability or country risk. Still, the translation of these indicators into risk weights is inevitably sensitive to modelling assumptions. The second issue is what regulatory instruments to use: risk weights, large exposure limits or a combination of the two? Higher risk weights raise the required capital on each unit of investment in sovereign bonds, aiming to ensure that banks are sufficiently capitalised to withstand eventual losses. Large exposure limits constrain risk concentration more directly. Soft limits - increasing risk weights based on a bank's concentration of sovereign exposures - are also possible, making them more similar to risk weights. For instance, an increasing capital charge may be imposed for exposures above the limit or for step-wise thresholds. The third issue concerns the consistency of credit risk regulation with the treatment of other risks. For example, sovereign debt tends to be held in the banking book, which does not require Pillar 1 capital charges for interest rate risk. The treatment of these holdings is therefore inconsistent with the use of zero risk weights in the credit risk framework, which effectively assume that the government can monetise its debt - which would necessarily translate into market risk. In addition, government securities are eligible for the LCR. This indicates that they can be sold at any time; moreover, even when used as collateral, they are subject to haircuts. Consistency would then suggest that they be held in the trading book. Requiring banks to reallocate their holdings accordingly would address both inconsistencies and would help to better align banks' risk-taking incentives, albeit at the cost of potentially larger reductions in capital at times of sovereign stress. The final issue is how to handle the transition to any new sovereign risk requirement. Non-zero risk weights would require banks in several jurisdictions to raise their capital ratios and strict exposure limits to scale down exposures, especially in countries with high public debt. To prevent any adverse impact, the transition to any new treatment would have to be gradual. And regardless of the letter of the regulation, experience suggests that banks might try to front-load the reduction in exposures. Where diversification possibilities are limited, such as in several EMEs, complementary measures to broaden the investor base would also help. In conclusion, the current prudential treatment of sovereign exposures is no longer tenable. Moving to a more balanced treatment that acknowledges the risky nature of public debt would provide a clear signal that no asset is truly default-free. It would also reduce distortions by respecting proportionality to risks, and weaken the adverse feedback loop between the sovereign and banks. That said, any change would also need to take into account the special role of sovereign debt in the financial system - as a source of liquidity and a potential buffer for the macroeconomy. Moreover, the risk of possible side or unintended effects, especially during the transition, needs to be addressed. Even then, though, banks would still be exposed to sovereign risk indirectly. And the sovereign is the ultimate backstop for the banking system. Hence, prudential regulation is a useful complement to sound fiscal finances, but not a substitute for them. The first step towards protecting the sovereign from financial sector risk is to recognise that fiscal positions, as typically measured, may provide a misleading view of a country's actual fiscal situation. This is especially the case during a financial boom, in particular if accompanied by a commodity upswing, notably in EMEs (Chapter III). Potential output and potential growth are overestimated. Compositional effects, especially those associated with rises in asset or commodity prices, boost revenues further.15 And nominal exchange rates may appreciate, temporarily reducing the domestic currency equivalent of foreign exchange-denominated debt and the corresponding interest payments. A further complication is that, under political economy pressure, policymakers may feel encouraged to relax fiscal policy further. Standard measures of the cyclically adjusted fiscal balance do not account for these effects. One possible, yet partial, remedy is to adjust the fiscal balance using measures of the output gap that incorporate information about credit and financial developments. Box V.A explains and illustrates the method. The comparison with ordinary measures is striking. In the boom that preceded the GFC, fiscal balances adjusted according to standard measures of the output gap were stronger than the corresponding unadjusted fiscal balance (Graph V.A, red bars). 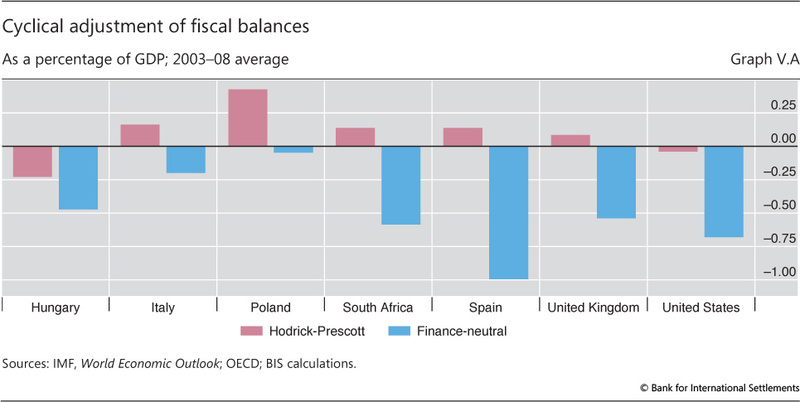 In comparison with either of these measures, fiscal balances adjusted using the finance-neutral output gap (a measure that incorporates information on the financial cycle) were weaker (blue bars). Between 2003 and 2008, the cyclical adjustment to the fiscal balance was negative and amounted to almost 0.70 percentage points of GDP in the United States, almost 1 in Spain and around 0.25 in Italy. Alternatively, for countries that rely heavily on commodity exports, the cyclical correction of fiscal balances can be made using information about commodity prices (Chapter III). Correcting fiscal balances in this way helps, but is not sufficient. To obtain a fully neutral measure of the fiscal balance over the financial boom-bust cycle requires other elements to be taken into account, including the compositional effects of asset price booms (for a given output level), exchange rate-induced effects on the valuation of debt, and systematic patterns in interest rate behaviour. Importantly, such a measure would also have to incorporate the expected realisation of contingent liabilities. In practice, contingent liabilities are hard to measure. Some are explicit and known ex ante, but most are not. Even when they are explicit and their full scope could be defined, the information is rarely aggregated. As to implicit liabilities, their scope is difficult to define ex ante. The historical record can provide some clues as to the possible losses. Direct bailout costs tend to increase with the size of the financial sector as well as the duration and scale of the financial boom. Even so, estimates based on past banking crises are subject to considerable uncertainty. A key indicator of the fiscal stance is the budget balance, ie government revenues minus current expenditure. However, since an upswing of the business cycle naturally boosts revenues and reduces expenditure, fiscal balances need to be adjusted in order to measure the underlying solidity of fiscal positions. Such an adjustment is normally based on standard measures of the difference between actual and potential output (the "output gap"). However, since these measures do not account for financial conditions, they may misestimate potential output. BIS research has developed an alternative measure of potential output obtained by augmenting a standard method (the Hodrick-Prescott (HP) filter) with information from credit and property prices (a "finance-neutral" measure). Such a measure can help to recognise in real time the economy's disguised overheating due to unsustainable financial booms, and the flattering effect on fiscal balances. This box illustrates how to obtain a finance-neutral measure of the fiscal balance by a simple modification of the cyclical adjustment procedure in use at the OECD. where Y and Y* denote, respectively, actual and potential output; Ti are revenues from different types of tax (personal and corporate income taxes, social security contributions and indirect taxes); G is primary government expenditure; and X is non-tax revenues. Tax revenues and government expenditure are adjusted by means of their elasticities with respect to the output gap, denoted, respectively, by ηTi and ηG. Naturally, estimates of the output gap play a key role in the formula. This is illustrated in Graph V.A, which compares cyclical adjustments based on the finance-neutral output gap with those based on the HP filter during the run-up to the Great Recession. The results are striking: the HP-filtered cyclical adjustments consistently improve the apparent fiscal strength for all countries, while those based on the finance-neutral measure worsen it in all cases. The average of the pre-crisis adjustment under the finance-neutral approach accounts for almost 1% of GDP in Spain and more than ½% in the United States and the United Kingdom, while it is around ¼% for Italy. The effects of the financial cycle on estimates of fiscal solidity are also visible for EMEs, although they are somewhat less sizeable. The average pre-crisis adjustment is about ½% for Hungary and South Africa, while it is close to zero for Poland, although this result compares with the positive adjustment of almost ½% suggested by the HP filter. The method illustrated above to correct potential output for the effects of the financial cycle has the advantage of simplicity, parsimony and transparency. Yet it also has drawbacks. One is that it only slowly recognises the permanent loss of output that appears to be a stylised feature of financial crises. Moreover, it does not adjust entirely for the effects of the financial cycle. These effects include the likely use of public sector money to support balance sheet repair during the bust; the compositional effects on tax and expenditure (for a given level of output); the exchange rate-induced effects on the valuation of debt and debt servicing costs; and systematic patterns in interest rate behaviour. And, as for any statistical method, it is subject to a number of caveats. C Borio, P Disyatat and M Juselius, "Rethinking potential output: embedding information about the financial cycle", BIS Working Papers, no 404, February 2013. C André and N Girouard, "Measuring cyclically-adjusted budget balances for OECD countries", OECD Working Papers, no 434, July 2005. For further details, see C Borio, M Lombardi and F Zampolli, "Fiscal sustainability and the financial cycle", BIS Working Papers, no 552, March 2016. These are discussed in detail in C Borio, P Disyatat and M Juselius, "A parsimonious approach to incorporating economic information in measures of potential output", BIS Working Papers, no 442, February 2014. This analysis also has implications for any assessment of fiscal space at the present moment (Box V.B), suggesting that the need for an additional buffer to address financial stability risks should be explicitly taken into account. This is especially important in countries that have recently been experiencing financial booms. But it also applies to those that have not: from a structural, long-run perspective, the extra buffer is an essential ingredient of macro-financial stability frameworks, regardless of specific cyclical conditions. Furthermore, interest rates have sunk to exceptionally and persistently low levels (Chapter II), which may lead policymakers and investors to overestimate fiscal sustainability. Can fiscal policy be used to contain financial sector risks? Fiscal policy could also be employed to actively restrain financial booms and stabilise output around a sustainable level, rather than simply containing a boom's fallout as it turns to bust. This could be done in two ways: by adjusting the cyclical stance of fiscal policy; or by modifying its structural component. At the cyclical level, fiscal policy could usefully help monetary and macroprudential policy to lean against the wind. Recent research suggests that tighter fiscal policy has, on average, materially restrained private credit growth with relatively small output costs (Graph V.4). And, at least compared with monetary policy, it could be more targeted (eg through taxes specific to the housing sector) and may avoid or at least limit the currency appreciation (and possible surge in capital inflows) that typically accompanies higher interest rates (Chapter IV). A key challenge is timing. Discretionary fiscal policy normally involves significant lags in decision-making and implementation. And political pressures towards a looser stance might also be especially strong. These problems could be mitigated by designing automatic stabilisers or budget rules that define ex ante how and under what conditions certain taxes or subsidies should be adjusted. The structure of taxes and subsidies can influence private sector decisions on leverage. Yet, at present, fiscal incentives often do more to encourage greater leverage than they do to support financial stability. Examples include underpriced government guarantees of debt liabilities and tax systems that favour debt over equity. Government guarantees for financial risks redistribute tail risks from the private to the government sector. Guarantees can help stabilise the financial sector at times of severe distress, but are also hard to price. As a result, explicit guarantees are likely to be underpriced, while implicit ones are essentially free. Underpricing encourages socially excessive debt accumulation and financial risk-taking. And guarantees can be pervasive. In the United States, for example, the government is estimated to have explicitly guaranteed no less than a third of financial sector liabilities in 2014, and a further 26% implicitly (Graph V.5, left-hand panel). Public debt is at record highs in advanced economies: its median value has increased by over 30 percentage points of GDP since 2007 and now stands at nearly 100% (Annex Table A.3). Furthermore, headline deficits are still large in several countries, pointing to higher debt in the next few years. In EMEs, the debt increase has been less dramatic, from 34% to 44%. But fiscal deficits and funding conditions there have worsened since 2015, reflecting in particular the sharp drop in commodity prices, currency depreciations and tighter global financial conditions (Chapter III). Despite high and rising public debt, calls abound in advanced economies for fiscal stimulus and, in particular, for greater public investment. According to some recent estimates, several countries still seem to have ample fiscal space - that is, room to raise debt without provoking adverse investor reactions - and should therefore take advantage of exceptionally low borrowing costs. But how much can we rely on these estimates? Fiscal space is an abstract concept that depends on market participants' perceptions of fiscal sustainability and liquidity. As such, any measure would inevitably be characterised by a large degree of uncertainty. Market perceptions of solvency will crucially depend on at least three factors. The first is the government's ability to impose higher taxes. This, in turn, depends on the economy's structure and potential growth. Taxes create distortions, creating Laffer curve effects: beyond a certain point, further tax increases may lead to output losses large enough to push down overall revenues. Moreover, politically tolerable taxation levels may be even lower than Laffer curves would suggest. And population ageing too is likely to weigh on future growth (Chapter III). The second factor is how far expenditure can be cut. Economies require some minimum level of government expenditure to function, and most societies have adopted social compacts that put a floor under spending of considerably more than that minimum. Increasing demands related to population ageing may, in particular, pose significant challenges. The third factor is the (growth-adjusted) interest rate on debt that is expected to prevail in the future. Risk premia on public debt are currently deeply negative in many advanced economies, but fluctuate widely and may at some point return to more normal levels (Chapter II). Their evolution, in turn, depends on market perceptions of the previous factors and on global financial market conditions. A final factor is the size of any future contingent liabilities due to a possible future financial crisis or even a natural catastrophe. That said, fiscal sustainability depends not only on a country's fundamentals, but also on investors' beliefs and behaviour. This creates the potential for debt crises to be, at least partially, self-fulfilling: agents may want to sell off debt because they believe others might do the same. This type of crisis is more likely to break out when debt is high, especially in foreign currency, and when policy credibility is low. A country's debt limit therefore depends not only on structural factors, but also on the interaction between government choices, market expectations and intrinsic randomness. Recent general equilibrium models that attempt to capture this complexity are promising, but their use is limited by computational complexity. In practice, simpler methods are often used. The most straightforward one consists in computing the steady-state debt level based on hypothetical long-run average values of the primary surplus and growth-adjusted interest rates (the gap between the average borrowing cost and growth). But these measures do not consider whether, in response to adverse fiscal shocks, a country would succeed in bringing debt back onto a sustainable path. This issue has been partially addressed by estimating fiscal reaction functions: in this case, debt is stable if the primary balance responds to increases in debt by more than the interest rate. There are, of course, limits to how much the primary surplus can increase, due to the factors mentioned above. Historically, countries have struggled to maintain primary surpluses of more than 5% of GDP for long. Recent methodologies have tried to take into account the diminishing ability to generate fiscal surpluses - or "fiscal fatigue". One popular approach is to use a non-linear reaction function - for example, one with a cubic shape - which amounts to postulating that, for sufficiently high debt levels, the response of the fiscal authorities diminishes as debt increases (see eg Ghosh et al (2013)). 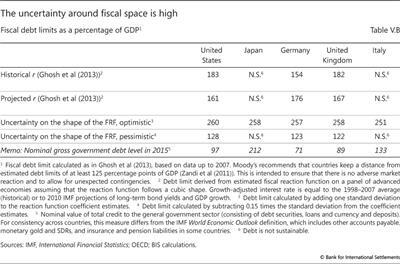 This approach finds debt limits of over 150% of GDP (Table V.B, first row) in the United States, Germany and the United Kingdom, which, given current debt levels (fifth row), indicates that relatively ample fiscal space exists in these countries. By contrast, the estimated fiscal response is insufficient to stabilise debt in Japan and Italy, suggesting a lack of fiscal space there. That said, these estimates of debt limits are subject to considerable uncertainty and should therefore be taken with great caution. For one, future interest rates and GDP growth are uncertain. Baseline estimates are based on historical averages of the growth-adjusted interest rate. Yet using projected values of the growth-adjusted interest rate (Table V.B, second row) leads to differences in estimated debt limits of about 20 percentage points. Another source of uncertainty is the shape of the non-linear relationship between the primary balance and the debt-to-GDP ratio. Since the reaction function is estimated on historical data, the parameters that determine the shape of this relationship are subject to sample uncertainty. To illustrate how this uncertainty translates into uncertainty about the effective debt limit, two alternative scenarios are constructed. The first scenario is a benign one and refers to a "more reactive" fiscal reaction function. This is obtained by raising the coefficients' point estimates by one standard deviation. The alternative scenario instead postulates a "less reactive" fiscal response, obtained by reducing the coefficients symmetrically by one standard deviation. The benign scenario (third row) implies much higher debt limits for all countries, in the region of 260% of GDP. 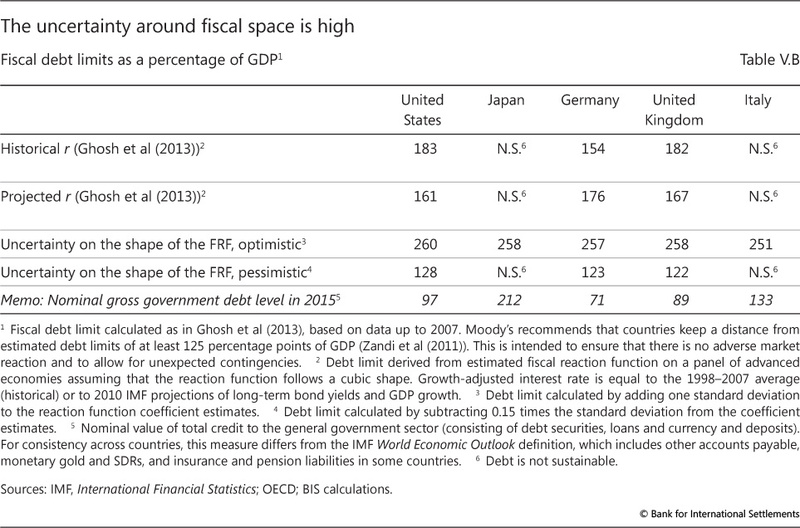 By contrast, under the pessimistic scenario, the fiscal reaction is not sufficient to stabilise debt for any country, indicating no fiscal space (not shown in the table). A somewhat more reactive reaction function, obtained by cutting the coefficients by just 0.15 times the standard deviation, succeeds in making debt sustainable for three countries, but at considerably lower levels; those in Japan and Italy, however, remain on an unsustainable path (fourth row). Cutting coefficients by more than 0.15 times the standard deviation would make debt unsustainable in a greater number of countries. It is striking that current debt levels can be either sustainable or unsustainable depending on parameters being just one standard deviation away from their point estimates. There are additional reasons why debt limit estimates should be treated with great caution. First, the estimates are largely based on extrapolation, as few countries have ever experienced debt levels anywhere close to those limits. Little is known about how governments or financial markets would react if debt rose that high or if governments were to communicate that they would only try to consolidate opportunistically - that is, only if growth were to pick up substantially. Importantly, it would be unsafe to assume that debt levels could reach their estimated limits without triggering a sharp increase in interest rates (which would, in turn, invalidate those estimates). Second, estimates largely ignore the risk that economic conditions may deteriorate and expectations of debt sustainability suddenly shift. In particular, a country's debt limit should naturally depend on a government's ability to sustain debt not only under average economic and financial conditions, but also under stressed ones - that is, for example, when tax revenues are low and/or interest rates high. Third, a future financial crisis cannot be safely assumed away. When contingent liabilities are taken into account, fiscal space would be reduced. Finally, and most importantly, the estimates do not explicitly incorporate the additional demands on fiscal resources from expected increases in age-related spending, which loom large in many countries. Existing methods have yet to capture these concerns satisfactorily. All in all, the above analysis and considerations indicate that the debt limits should not be interpreted as boundaries that can be safely tested. Prudent policymakers should try to keep debt levels well away from them: the estimated fiscal space is not space that can be entirely spent. That is why, for instance, Moody's recommends that countries maintain a buffer of 125 percentage points of GDP below the limit it estimates. While it is unclear how this threshold has been set and why it should be identical across countries, it does seem to have a relationship with credit ratings: Moody's reports that all sovereigns rated Aaa have at least 125 percentage points of fiscal space, while those rated Baa or less have less space or none. To be sure, it is still an open question how best to determine the buffer's optimal size, given a country's characteristics. But, at a minimum, the buffer indicates that the "safe" limit may be far below the "estimated" one. That is, policymakers should be aware that having fiscal space - as determined by current methods - does not mean it is possible or advisable to use it all. See M Obstfeld, "On keeping your powder dry: fiscal foundations of financial and price stability", Monetary and Economic Studies, vol 31, November 2013. See P D'Erasmo, E Mendoza and J Zhang, "What is sustainable public debt? ", Handbook of Macroeconomics, vol 2, forthcoming. See B Eichengreen and U Panizza, "A surplus of ambition: can Europe rely on large primary surpluses to solve its debt problem? ", Economic Policy, vol 31, 2016. A Ghosh, J Kim, E Mendoza, J Ostry and M Qureshi, "Fiscal fatigue, fiscal space and debt sustainability in advanced economies", Economic Journal, vol 123, February 2013; see also J Fournier and F Fall, "Limits to government debt sustainability", OECD Economics Department Working Papers, no 1229, 2015. The estimates are based on data up to 2007, as in Ghosh et al (2013), but there are good reasons to believe that the fiscal reaction has become flatter since then: that is, many countries have accumulated large amounts of public debt and have been slow to consolidate. M Zandi, X Cheng and T Packard, "Fiscal space", Special Report, Moody's Analytics, December 2011. 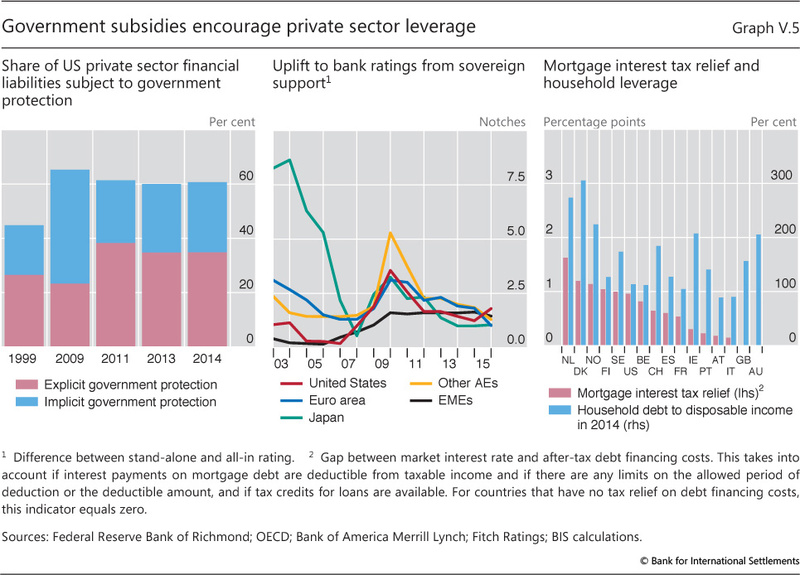 Globally, bank creditors also benefit from implicit government support. The centre panel of Graph V.5 shows the ratings uplift that bank bonds gain from implicit sovereign support. Around the time of the GFC, implicit support boosted bank credit ratings by 2-3 notches on average. At end-2011, such support lowered the spreads that banks had to pay on long-term bonds by an estimated 1-2 percentage points. The implicit degree of support has since declined, but bank bonds continue to benefit from an estimated subsidy of 30 basis points. Recent policy initiatives that raise bank capital and facilitate the orderly resolution of large banks aim to curtail the need for government support of the financial sector in periods of stress and hence to reduce this implicit subsidy. In most countries, tax systems favour debt over equity. Removing this debt bias would increase the resilience of private sector balance sheets and help reduce the likelihood and cost of crises (Box V.C). In the corporate sector, the asymmetrical tax treatment of different funding sources has no strong economic rationale. Yet corporate income taxes generally allow interest payments to be deducted when determining taxable profits, whereas the return-on-equity, either through dividends or capital gains, is typically not deductible.17 Across most major economies, the tax savings from debt relative to equity issuance appear large. For instance, estimates indicate that in, say, the United States, Japan and France the marginal effective tax rate on debt is over 12 percentage points lower than that on equity (Graph V.6, left-hand panel). The preferential tax treatment of debt over equity affects firms' funding choices, potentially increasing the likelihood and cost of financial crises. Firms have an incentive to increase leverage to reduce their tax burden, which may heighten their own vulnerability and that of the corporate sector as a whole. This box briefly reviews evidence concerning the impact of the tax code on firms' financing decisions. Early empirical studies based on the use of non-debt tax shields (eg depreciation and investment tax credits) failed to find a strong link between taxes and leverage. Yet, thanks to better measurement of marginal tax rates, subsequent work in the 1990s and 2000s succeeded in pinpointing a statistically significant yet modest relationship: meta-analysis based on many studies finds that a 1 percentage point lower tax on corporate income reduces the debt-to-asset ratio in non-financial corporations by only 0.27 percentage points. For banks, the literature found a broadly similar effect, although for larger banks the effect seemed weaker. However, these studies are cross-sectional. As such, they may not fully capture the causal effect of tax changes. The latest stream of research has addressed this concern by exploiting tax changes within countries. For example, since 2006, changes in tax laws have enabled firms in Belgium to deduct a notional interest expense from their return on equity. For non-financial firms and banks, the effect of these changes on leverage is similar to that found in the previous literature. That said, the latest empirical work also finds other financial stability benefits in the banking sector from reducing the tax debt bias. For example, following a reduction in the tax discrimination against equity, banks started to manage their risks against return more conservatively, in that weakly capitalised banks directed new lending to firms with lower default probabilities. The broad benefits from eliminating the debt bias appear substantial. A number of studies calculate, first, how much bank leverage would fall; then, how much the probability of a crisis diminishes as a result; and, finally, the corresponding GDP gains. For example, De Mooij et al (2014) estimate gains of between 0.5 and 11.9% of GDP, depending on the initial level of bank leverage. Langedijk et al (2015) find that the direct bailout cost of a systemic financial crisis on public finances could be reduced by between 17 and 77% in European economies. All in all, this evidence suggests that removing, or at least reducing, the debt bias in taxation could be a key ingredient of a macro-financial stability framework. S Myers, "The capital structure puzzle", Journal of Finance, vol 39, 1984. L Feld, J Heckemeyer and M Overesch, "Capital structure choice and company taxation: a meta-study", Journal of Banking and Finance, vol 37, 2013. M Keen and R de Mooij, "Debt, taxes, and banks", IMF Working Papers, no 12/48, 2012. F Panier, F Pérez-González and P Villanueva, "Capital structure and taxes: what happens when you (also) subsidize equity? ", Stanford University, working paper, 2013; G Schepens, "Taxes and bank capital structure", Journal of Financial Economics, forthcoming; and L Gambacorta, G Ricotti, S Sundaresan and Z Wang, "The effects of tax on bank liability structure", mimeo, 2016. R de Mooij, M Keen and M Orihara, "Taxation, bank leverage, and financial crises", in R de Mooij and G Nicodème (eds), Taxation and regulation of the financial sector, MIT Press, 2014; and S Langedijk, G Nicodème, A Pagano and A Rossi, "Debt bias in corporate income taxation and the costs of banking crises", CEPR Discussion Papers, no 10616, 2015. Evidence indicates that such tax advantages can have significant effects on firms' leverage (Box V.C). 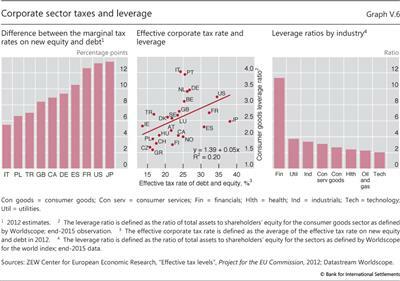 Firms tend to have higher leverage in countries with higher effective tax rates on corporate income (Graph V.6, centre panel). As with mortgage debt, the significant dispersion of corporate leverage, both within and between sectors, is a clear indication that other factors matter. These include the pledgeability of assets as collateral, revenue volatility, and broader aspects of legal and governance frameworks. Even so, changes in the tax code could make a difference, especially in the financial sector, where leverage ratios are particularly high (Graph V.6, right-hand panel). 1 See eg Ò Jorda, M Shularick and A Taylor, "Sovereigns versus banks: credit, crises, and consequences", Journal of the European Economic Association, February 2016; C Reinhart and K Rogoff, "From financial crash to debt crisis", American Economic Review, vol 101, August 2011; M Bordo and C Meissner, "Fiscal and financial crises", NBER Working Papers, no 22059, March 2016; and L Laeven and F Valencia, "Systemic banking crises database", IMF Economic Review, vol 61, 2013. 2 See eg L Laeven and F Valencia, "Systemic banking crises database", IMF Economic Review, vol 61, 2013; and P Honahan and D Klingebiel, "Controlling the fiscal costs of banking crises", Journal of Banking and Finance, vol 27, 2003. 3 C Borio, E Kharroubi, C Upper and F Zampolli, "Labour allocation and productivity dynamics: financial causes, real consequences", BIS Working Papers, no 534, December 2015. See also C Reinhart and V Reinhart, "Financial crises, development, and growth: a long-term perspective", The World Bank Economic Review, April 2015. 4 F Eschenbach and L Schuknecht, "Budgetary risks from real estate and stock markets", Economic Policy, vol 19, 2004. 5 See eg C Reinhart and K Rogoff, "The forgotten history of domestic debt", Economic Journal, vol 121, 2011. Ratings acknowledge that domestic (local currency) debt is not riskless. For the 74 sovereigns that received first-time local currency sovereign ratings from at least one of the three major rating agencies between 1995 and 1999, the average gap between local and foreign currency ratings for the same sovereign narrowed from about 1.8 notches to 0.2 as of end-2015. 6 See Committee on the Global Financial System, "The impact of sovereign credit risk on bank funding conditions", CGFS Papers, no 43, July 2011. 7 See eg M Adelino and M Ferreira, "Bank ratings and lending supply: evidence from sovereign downgrades", Review of Financial Studies, forthcoming, 2016; and Y Baskaya and S Kalemli-Özcan, "Sovereign risk and bank lending: evidence from the 1999 Turkish earthquake", unpublished mimeo, 2015. 8 Short-term debt issuance usually increases steeply during episodes of fiscal stress, reflecting both the risk of default and higher future inflation. This increases rollover risks for the sovereign. 9 See eg V Acharya, I Drechsler and P Schnabl, "A pyrrhic victory? Bank bailouts and sovereign credit risk", Journal of Finance, vol 69, 2014; and V de Bruyckere, M Gerhardt, G Schepens and R Vander Vennet, "Bank/sovereign risk spillovers in the European debt crisis", Journal of Banking and Finance, vol 37, 2013. 10 See eg M Bottero, S Lenzu and F Mezzanotti, "Sovereign debt exposure and the bank lending channel: impact on credit supply and the real economy", Harvard University, working paper, January 2016. 11 See eg V de Bruyckere, M Gerhardt, G Schepens and R Vander Vennet, "Bank/sovereign risk spillovers in the European debt crisis", Journal of Banking and Finance, vol 37, 2013; and A Demirgüç-Kunt and H Huizinga, "Are banks too big to fail or too big to save? International evidence from equity prices and CDS spreads", Journal of Banking and Finance, vol 37, 2013. 12 See Bank for International Settlements, "Treatment of sovereign risk in the Basel capital framework", BIS Quarterly Review, December 2013, p 10. 13 See also Box VI.E in the 85th Annual Report. 14 For a formal argument on how regulation can lead to a reduction in interest rates, see eg E Fahri and J Tirole, "Deadly embrace: sovereign and financial balance sheets doom loops", NBER Working Papers, no 21843, January 2016. 15 Asset price booms can affect personal and corporate income taxes as well as rental income through sales or the accrual of capital gains. In addition, taxes are also paid on transactions. Since turnover intensifies during a boom, revenues tend to increase for a given level of asset prices. 16 See P Hendershott, G Pryce and M White, "Household leverage and the deductibility of home mortgage interest: evidence from UK house purchases", Journal of Housing Research, vol 14, 2003. They estimate that the removal of mortgage tax relief in the United Kingdom reduced initial loan-to-value ratios of unconstrained purchasers by 30%, but had a smaller effect on more constrained borrowers. 17 Also, personal income taxes on capital gains and dividends magnify debt bias. However, personal income taxes on interest income can reduce it.